It is also a world that honors its past. And by that I mean that the first seven minutes of this movie were merely clips from the first movie inserted between the various opening credits. But we’re here for sweat-drenched man deeds of glory so it’s all good, right? Once the credits are finally finished, we don’t see Hercules for about twenty minutes! That doesn’t stop director Luigi Cozzi from pouring on his latest contribution to the bad special effects legacy of the Hercules movie franchise! A guy painted up like the Ultimate Warrior is trying to sacrifice a maiden to a lightning monster! Sadly, no one can save the maiden. Even more sadly than that, we are subjected to a bunch of shiny lines squiggling here and there that are supposed to pass for the lightning monster. Can even the great demi-God Hercules save us from this half-hearted trash? Damn right he can! After his last adventure where he laid the wood on the evil King Minos, Zeus retired Hercules to the sky to live with the Gods! Like all great world-saving heroes that go into retirement, he gets called out of retirement one more time to save the world, Zeus, and the whole freaking universe! A rebel group of gods including a very wimpy Poseidon (watch him run away like a little girl when King Minos is shooting energy blasts at him!) have conspired to steal the seven thunderbolts of Zeus! Without them, he doesn’t have any powers. Luckily, even though he’s powerless, he still has the power to haul Hercules out of the sky and down to Earth so that he can retrieve the thunderbolts. In a bit of good news for the viewer, it turns out that the thunderbolts are hidden in monsters! Yes! I’m sensing badly costumed dudes getting heaved around in slow motion! The rebel gods find out about this and haul their own champion out of retirement. King Minos gets brought back from the dead to kill Hercules and rid the bad gods of the last obstacle between them and whatever it is they’re trying to accomplish. The only hitch in their plan is that as much as King Minos (William Berger, the best thing in this movie along with Lou’s monster hooters) hates Hercules, guess who he hates even more? The gods! Minos is all about science and chaos triumphing over the gods, so as soon as he’s able to, he starts killing off the very gods that brought him back to life! No wonder we ditched those fake dimbulb gods for our real God! The first creature that Hercules has a run in with is a guy in a monster suit that looks like it was made out of a combination of dirty mops and doghair. There’s lots of rolling around, jumping in the air and whenever Hercules throws a punch that connects, the screen flashes red and we get a spacey sound effect. Luigi Cozzi demonstrates his knowledge of how to pace a movie in that while truly humiliating, that costume wasn’t the worst one! That would come later when Hercules battled a bunch of Slime People. They looked like walking cowpies. There’s no doubt that Hercules is still in tip top he-man form, but this Hercules is a more mature one as well. In the previous movie, he stood around a lot, offering very little in the way of anything except for smashing, busting, throwing, and breaking whatever was in front of him. This time he’s talking about currents and air flow in caves and offering his commentary on sculptures inside a Gorgon’s lair, remarking on how lifelike and tense they look. In the best tradition of Italian cinema, Luigi saves the absolute worst for last! I speak of course of the clashing of titans that is Hercules vs. Minos II! A conflagration of crappiness that could only take place in the heavens with the very fate of all existence at stake! 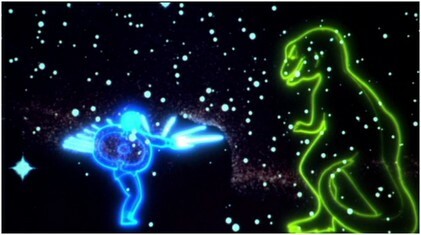 Each of them becomes imbued with the power to become pure energy which results in more ugly animation as the cartoon outlines of these two fight it out! But that sort of fiasco could end any bad movie! The Adventures of Hercules proves itself alone in the pantheon of putridness as it has Hercules and Minos transform into other creatures during their fight! Minos suddenly becomes a Tyrannosaurus Rex! Hercules responds the only way he can by becoming…an ape! But then Minos switches to a big snake! And then Hercules wins somehow. Job well done. Time for a rubdown and some Icy Hot and then – Wait! 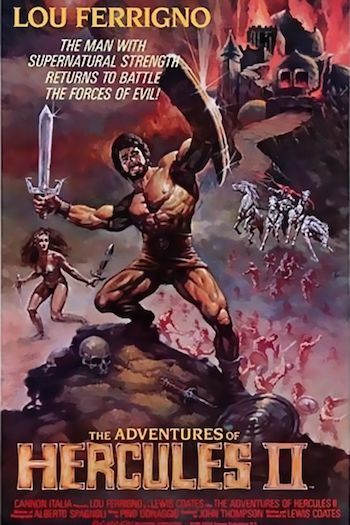 Sure, any movie that smells like Herc’s jockstrap after a month of nonstop monster fighting could end like that, but The Adventures of Hercules is bound and determined not only to smell like his jock, but to make you eat it as well! 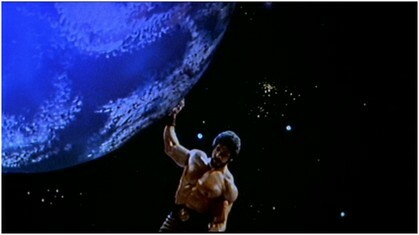 You see, Hercules still has to save the moon from crashing into the Earth! No one really seemed to have any idea what this had to do with anything, but when Zeus magically enlarges you so that you’re bigger than the planets and can get between them and push them back into orbit, you just go with it.